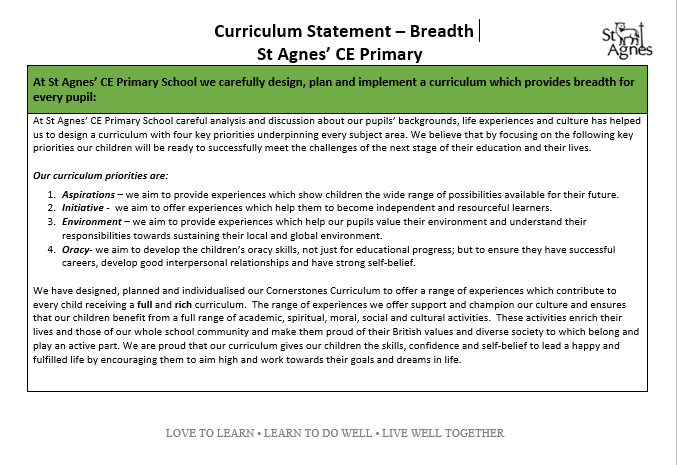 Here at St Agnes CE Primary School we provide a creative curriculum based around the Cornerstones Curriculum, a nationally recognised approach for delivering outstanding learning opportunities for children. We use this as a scaffold when providing our children with a unique curriculum that is catered for them and the context of the school. Alongside our Christian Values, Peace Mala School Ethos and our Rights and Respecting work, we weave the Cornerstones topics in a way which covers the National Curriculum in a fun and exciting way. One that is unique to Longsight at times, to make sure the children’s learning relevant to them and their experiences in the community. Through Cornerstones, we want to provide the children with new experiences and opportunities to explore their learning in a fun way. 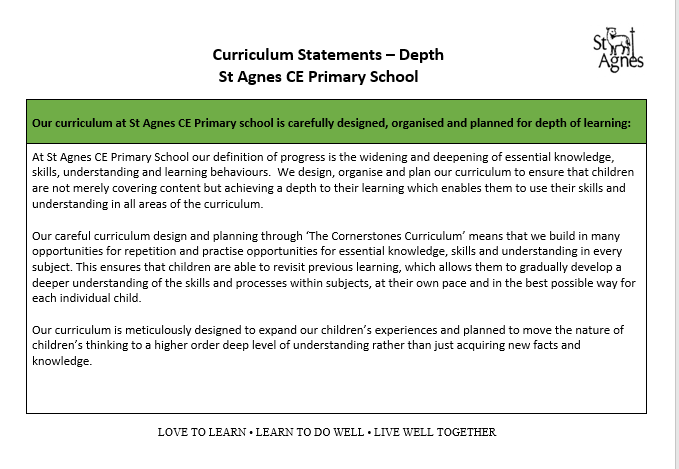 The Cornerstones Curriculum is a creative and thematic approach to learning that is mapped to the 2014 Primary National Curriculum (please click here for more information) to ensure comprehensive coverage of national expectations. Our new curriculum will be delivered through Imaginative Learning Projects (ILPs) which will provide a rich menu of exciting and motivating learning activities that make creative links between all aspects of our children’s learning. Certain subjects and areas will still be taught discretely including English, maths, aspects of science, PSHE, PE, RE and computing. How does the Cornerstone Curriculum work alongside the National Curriculum? 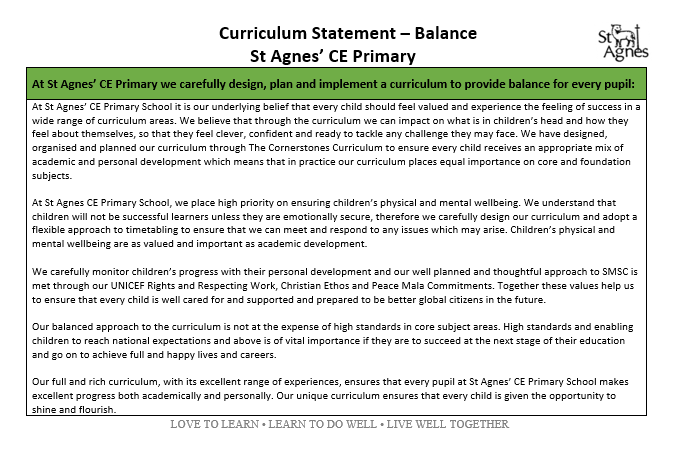 St Agnes’ use of the Cornerstone Curriculum follows all the requirements of the National Curriculum, but we are proud to offer a much broader curriculum than that, making the most of many and varied opportunities to broaden and enrich the curriculum for our children through our Peace Mala and Rights and Respecting Work. Our children receive an education that is exciting, fun and worthwhile, unique to their needs and prepares them for life beyond school and laying the foundations for lifelong learning. What should my child be learning in their Year Group? If you would like to see what your child is learning currently, please go to their individual class page. There you will find a breakdown of what learning is taking place, across the curriculum, each half term/term.